You have probably seen this image, watched the video or both. 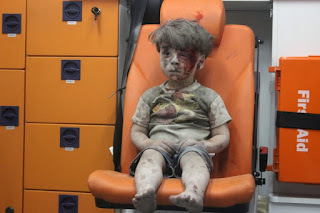 A Syrian child covered in dust and blood sits in an orange ambulance chair, gray and alone. His stunned, mute face has been hailed a "symbol" of his country's devastation and suffering. His huddled frame was Photoshopped into pictures with world leaders, the latest emblem of the international community's failure to bring to an end one of the ghastliest civil wars in modern history. The good news is that Omran Daqneesh, the young boy pulled from the rubble of an airstrike in the Qaterji neighborhood of Aleppo, is alive. So too, according to reports, are his parents and siblings. The bad news is that the conflict that has hollowed out his home town, once Syria's most populous urban center, shows little sign of flagging. And that, beyond Omran's heart-rending rescue, there are too many stories of children who could not sit in that ambulance chair, looking back at the world's cameras. We've been here before, of course. Last year, the image of the drowned toddler Alan Kurdi, his lifeless body resting on a Turkish beach, seemed to wake up the outside world to the misery and horror of the Syrian refugee crisis. But despite an outpouring of global woe and lamentation, little changed. In the months since Alan drowned, fears over integration and terrorism saw Europe grow more hostile to Syrian refugees seeking sanctuary in the West. The toddler's father chose to return to his ruined home city of Kobane, along the Turkish border, in a move that epitomized the tragedy and futility of the moment. In Aleppo, the local media activist who documented Omran's survival has witnessed ceaseless violence and death. "I’ve seen so many children rescued out of the rubble, but this child, with his innocence, he had no clue what was going on,” Mustafa al-Sarout, who filmed the video that went viral, told the Guardian. “He put his hand on his face and saw blood. He didn’t know even what happened to him." Sarout went on: "These are children bombed every day. It’s not an exceptional case. This is a daily fact of Russian and Syrian government airstrikes. They take turns bombing civilians in Aleppo before the whole world. This child is a representative of millions of children in Syria and its cities." The Syrian regime, backed by Russian air power, has been relentlessly bombarding rebel-held areas of Aleppo. The city and its environs are contested by a constellation of rebel factions, regime forces, Kurdish militias and the Islamic State. Tens of thousands of children have perished in Syria's civil war, including others on the same day little Omran was rescued. The conflict has claimed the lives of nearly half a million people since it flared in 2011. "Pieces of children’s bodies being pulled from rubble are photographed with appalling regularity in a war of indiscriminate attacks, most often from government airstrikes and shelling but also from rebel mortars," writes Anne Barnard in the New York Times. Those images of dead kids are less shared, out of propriety and squeamishness. But it's a reality that shouldn't be ignored. Nor too the other real excesses and brutality of the government in Damascus that purports to represent all Syrians. On Thursday, Amnesty International released a new report looking at the abuses carried out in the Assad regime's prisons, based on the testimony of dozens of "torture survivors." The rights group estimates that 17,723 people have died in Syrian regime custody since March 2011, when the uprising against the rule of Syrian President Bashar al-Assad began. To be sure, as a February U.N. human rights report documented, both loyalist and antigovernment forces have committed possible war crimes. Aleppo, once Syria's commercial capital, presents both a picture of a country's tragic implosion as well as a glimpse of a future shaped by irrevocable divisions. The city's west remains occupied by forces loyal to the Assad regime and is in better shape than the rebel-held east, as my colleagues reported last week. The Assad regime has been boosted by a strengthening Russia-Iran alliance, signaled by reported Russian airstrikes launched from an Iranian base this week. This is despite concerted American diplomatic efforts to get Moscow to both apply more pressure on Assad and perhaps help minimize the role played by Iranian proxies in the conflict. "The Russians are showing they have options in Syria while they have Washington over a barrel on Aleppo,” Andrew Tabler, Syria expert at the Washington Institute for Near East Policy, told PBS. Thousands of Shiite fighters linked to Iran have entered the fray. Tehran has long backed the Assad regime in Damascus, which it sees as an essential ally in its wider rivalry with Saudi Arabia and other Sunni Arab states. "The balance of power in the region as a whole is also at stake," wrote Youssef Sadaki, laying out the geopolitical chess map in a blogpost for the Atlantic Council. The sectarian dimension of the battle is clear. An Islamist rebel faction — until very recently linked with al-Qaeda — was instrumental in lifting a government siege in southwestern Aleppo earlier this month. Its rhetoric is staunchly anti-Shiite and Alawite, the minority sect to which Assad belongs. It's part of an ever-deepening polarization in the country. "Extremist rebel forces are seeking to drag more people into their unabashedly sectarian rhetoric, which the opposition should resist if it wants to avoid helping Bashar Al Assad" further stigmatize his opponents as radical terrorists, wrote analyst Hassan Hassan. Jonathan Spyer, writing in Britain's Spectator magazine, lays out three distinct and unacceptable visions of Syria endgame: "What matters is that three outcomes be avoided: the Assad regime should not be permitted to reunite Syria under its rule, the Islamist rebels should similarly not be allowed to establish a jihadi state in the country, and the Islamic State should not be permitted to remain in existence." U.S.-backed Syrian Kurdish militias, many of which are secular and more capable than other Syrian rebel factions, have offered the biggest source of hope for Western observers of the war — though the Kurds themselves have many critics, as well. "We're at a juncture in which the United States has been left with few choices," explains Lina Khatib in an interview with the Council for Foreign Relations. "Through its regional allies, the United States should work toward the least-bad scenario, trying to push these groups to embrace moderation and empower the few remaining groups that are not ideological."